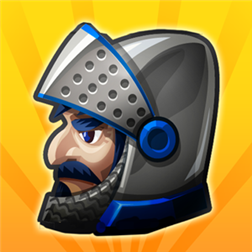 Fortress Under Siege is a new fun Windows Phone 8 game that is free on the Windows Phone Store. As one of the last loyal generals of the realm it is your mission to fortify the frontier against this gruesome onslaught and prepare new men for battle: Train brave soldiers, archers and horsemen, forge an army and build powerful battlements with catapults and ballistas, dig tar-pits on the fields and set them aflame in this Medieval-themed castle defense game. Construct houses, barracks and workshops to improve your men’s fighting skills and lure the enemy into deadly taps – wave after wave – but spend your gold wisely for you will encounter gruesome enemy-bosses and their fanatic minions. Fight them off with 16 different types of units at your command. Defend the crown against an international conspiracy of nobles and save your late king’s daughter, the rightful heiress to the throne. Written by: Hyde13 on October 9, 2013.